Problems starting the car, usually after a short run (when the interior is warm), though in some cases, the car may fail to start at any time. A classic time for the problem to occur is at the gas station, or if you park for a minute to get something from a shop. If the car is parked for a long period, the interior usually has cooled enough for the joint to make contact again, and you won't notice a problem. As the cabin temperature is a major feature of this problem, it might appear worse on cold or rainy days when you have the heater running to clear the windows etc. Extremely cold temperatures can also cause the problem to be more apparent. The main relay wouldn't fire up the fuel pump due to the soldering cracks on the Relay PCB. in or near the fuse box area and due to its size is quite easy to find. The steps below show removal of the relay from a right-hand drive 88-91 CRX, however the steps are exactly the same for the left-hand drive model. 10mm Ring spanner (preferably ratchet type). 1. Remove the hood lever with a 10mm socket and extension bar. There are two bolts, the bottom one is being removed in the picture. When the bolts are out the level will fall out of the way. 2. Remove your fuse box cover to gain access to the coin holder. Now remove the coin holder - spring it open and you will see two screws at the top and one at the bottom. When the holder is out of the way we can see the top of the relay. 3. The bolt securing the relay is well hidden, you can access it from the directly above the hood lever. The bolt is impossible to see unless you get your head in the foot well so just use have a feel for it. 4. A ratchet spanner greatly speeds up removing the relay although it is possible with a normal ring spanner but it will take a few minutes. DO NOT try to use a open-ended spanner as you will probably round the bolt! Only use a ring-spanner if you do not have a ratchet one! 5. With the bracket loose we can now lift out the relay. Along with the bolt, the bracket is hooked with a tag so you may have to wiggle it a bit to free it off or it might just lift straight out. 6. The relay will now lift out - it is fitted with a long lead so you can easily get into the connector, and unplug it. the hole on the car as this will hold the relay in the exact position for the bolt to go in. - Soldering Iron, powered around 25w is fine. - De-soldering tool - pump style, braid or de-solder station if you are lucky. 1. Bend back one of the retaining clips and lift up one side of the relay, then repeat with the other side. 3. Slide the relay PCB board from the housing. Note that it only fits one way. 4. Now you have to remove the old solder from the board. 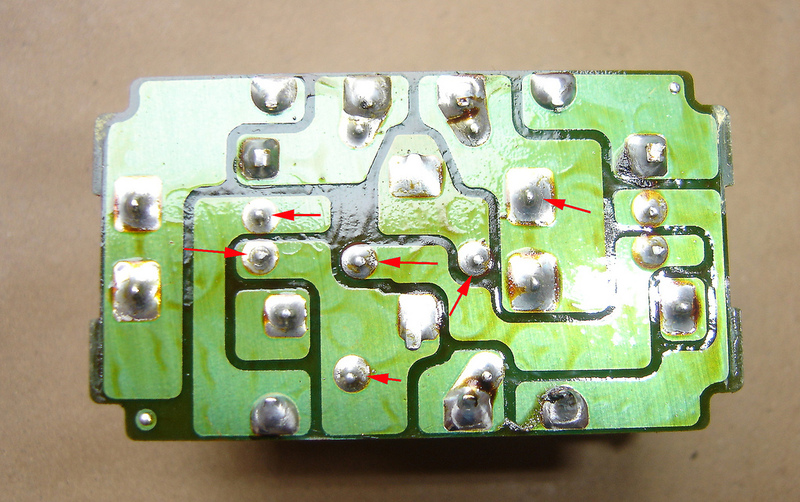 I recommend you only de-solder and re-solder one connection as a time as there is a chance some of the components may fall out the board inside the relay requiring it to be dismantled. 5. Now re-solder the connections making sure you use enough heat to fully flow the joint - compare your joints to the picture. They should have a shiny finish. If the finish on your joints is dull, you are probably using a poor quality solder, or not enough heat. 6. Next you can remove the flux from the board. This isn't strictly required but it's nice to finish the job properly. Spray on plenty of Alcohol solvent and use the brush to remove the flux, you may need to do this a couple of times to get rid of it all. This will make a bit of a mess. The relay can now be clipped back into its housing and reinstalled to the car. I have this problem and was thinking I'd just have to live with it as anyone I've talked to about it didn't have a clue. Might try and get this done this weekend. I used to have problems with both of my EF's in the summer on hot days, the main relay would stick and you couldnt get the car started till it cooled down. All I used to do was take the relay out, pull the cover off then take compressed air and blow the dust and grime from the contacts and then spray some WD40 on it and that did the trick everytime. Plus I also always carried a spare relay in my emergency kit just in case! Did this today! Was easier than it looks. Hopefully that did the trick, I'll keep you posted. Yeah let us know. I might have to try this when it gets a bit warmer. No problems since. Filled up with gas and started right up after. Have to see how it does with a bunch of little trips and things. Wait for hot/humid days to see if it gives problems. I had this problem on my da i couldn't find the problem so i sold it. If i knew it was this easy to fix i wouldn't have sold it. Take out the main relay, open it and inspect it. If there's dried or cracked solder joints, then resolder. Brand new main relays are close to $100+ at the dealers. which year civic have this type of relay ? Does 2004 civic lx has this type of relay? Well, today I replaced my CRX Main relay. Here is a picture of my old one. As you can see there are many solder joints that are cracked or starting to crack. I am gonna resolder the joints on the old relay and keep as a backup. Cracks would appear over time and can be re-soldered, or you can buy a new one from the dealer. I repaired the main relay board in my 1991 Accord about 5 years ago because the car wouldn't start when it was hot with the windows closed. The car recently wouldn't start occasionally in this colder winter weather. I replaced the fuel filter, air filter, distributor cap/plugs and wires and the problem got worse when it stalled while accelerating. The last time it stalled in front of someone's house two blocks away and I couldn't get it to run at all. My neighbor and I pushed it home and I removed the main relay board again and looked at it for cracks with a magnifying glass, but it looked okay. I thought I might as well heat all the solder joints again since I had it in sitting on my work bench. I put it back in it the plastic housing and plugged it in. The car started immediately and it's been running like it's supposed to... so far. I noticed in the pictures of the board that there was a lot of solder flux residue left on the board the honey colored stuff. I work on electrical and electronic components in the aerospace field where we remove the flux with a flux remover or with isopropyl alcohol. I've noticed that most consumer electronics manufacturers don't require it to be removed, and I believe that most people see it and think it is normal. While it isn't necessary to remove it for the board to operate, it does make it look nicer and makes inspection for cracks or cold solder joints easier. Just use alcohol and a cotton swab or an acid brush if you have them. Great thread by the way. had a similar issue with my car and Honda fixed it.